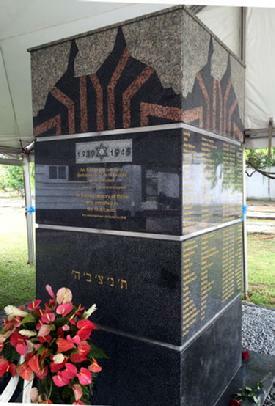 March 18, 2016, a Holocaust memorial to 105 Surinamese Jewish victims trapped in Holland was dedicated in Paramaribo, Suriname. Memory was given to the murdered in the dark night of the Nazi evil that engulfed the world, 1939-1945. Jews first settled in Suriname in 1639. They sought life and freedom, fleeing the long death reach of the Spanish Inquisition. They found shelter and a future in Suriname. Building sugar plantations in the middle of the jungle and along the Suriname River, they were granted the right to create a Jewish autonomous home, known as the Jodensavanne. They constructed their own legal courts, military defense force, synagogue and an independent Jewish life, the first in over 1,600 years. Fortunes were made and lost. Resettling over time in Paramaribo, the Jewish world as Surinamese was firmly planted until it's future was traumatically cut in Europe. The truncated community of White and Black Surinamese Jews struggles and yet lives on today. The Jews of Suriname provided financial support for the first Permanent Jewish House of Worship in America, Mikveh Israel, N.Y. The Jewish American Society for Historic Preservation provided the key funding enabling Neve Shalom Congregation, Paramaribo to build the Holocaust Memorial for the Jews of Suriname.